It’s no secret seniors face a variety of age-related health issues, including heart disease. However, with the right lifestyle choices, seniors can reduce or eliminate their risk all together. 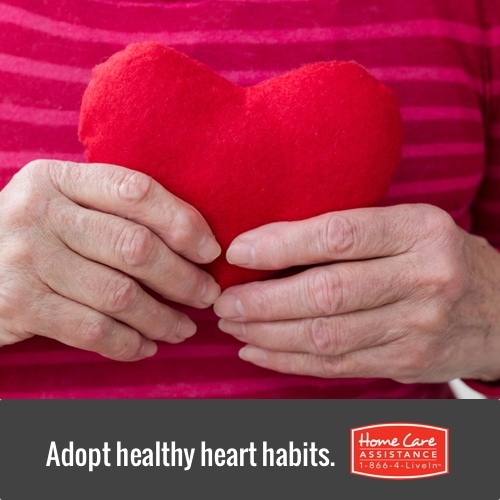 Here are 5 tips from Harrisburg Home Care Assistance that promote health, wellbeing, and can help your senior loved one live a heart-healthy lifestyle. The nicotine in cigarettes raises blood pressure, reduces the amount of oxygen the heart receives, increases heart rate, adversely affects blood vessels, and increases the possibility of developing blood clots. Quitting smoking can decrease the risk of heart disease and heart attack by 50 percent or more. A heart-healthy diet includes a wide variety of fruits, vegetables, and whole grains. It’s also low in calories, high in fiber, and is an important source of vitamins and minerals. Specifically, vitamin D may reduce the risk of heart disease and can be taken as a supplement or found in fish, mushrooms, and egg yolks. Staying active boosts energy levels and strengthens all parts of the body including the heart. Cardio exercises that really get the heart pumping include swimming, walking, tennis, hiking, and dancing. Stress can cause back and stomach pain, asthma, headaches, insomnia, deplete energy, and contribute to heart disease. In addition to regular exercise, encourage your loved one to try meditation and yoga to reduce their stress levels. Seniors who carry around extra pounds put themselves at a higher risk for heart disease. Portion control and decreasing fatty foods helps seniors rid themselves of those unwanted pounds. Coronary heart disease and heart failure is connected to obesity in the elderly. Being overweight is a contributing factor to high blood pressure and increases the chances of a stroke. Interested in learning more about senior health and wellness? Reach out to an experienced Care Manager at (717) 540-4663. Our Care Managers are happy to answer questions you have or discuss care options for your senior loved one, including live-in or flexible hourly home care in Harrisburg. With a little extra help from one of our highly trained caregivers, your loved one can maintain a happy, healthy, high-quality lifestyle.